Calling all existing and aspiring MindManager Power Users! Save an additional 10% on our Mindjet MindManager for Windows add-ins as a Mindjet Subscriber and take your Mapping to another level starting today! You can even save 20% on our 4 for 1 bundle! 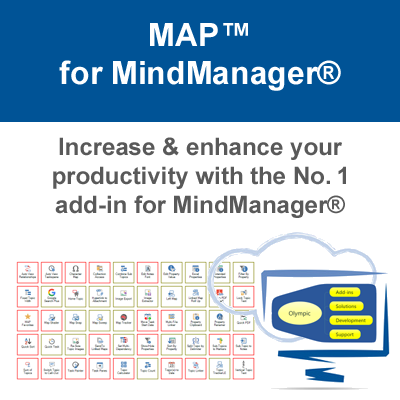 You are one step away from taking your Mapping with MindManager to a completely new level of application and productivity. Join the thousands of MindManager users all over the world who extend their use of MindManager by utilizing add-ins developed by Mindjet International Value Added Partners. Olympic have been using MindManager and developing add-ins that take advantage of MindManager’s API for more than 15 years and we are one of the most active Mindjet Development Partners in the world. We provide “off the shelf” add-ins such as MAP and Task4Maps as well as providing Macros and custom development projects for specific client solutions. Now is also a great time to start your add-in collection and save money with our current special offers. Mindjet subscribers get an additional 10% off any single Olympic add-in using code “Mindjet10” when checking out. If you’re really excited by the possibilities of using MindManager & add-ins then our 4 for 1 Bundle gets you ALL current Olympic developed add-ins for one great price PLUS an additional 20%! Use the code “MIVAP20″ at checkout. Scroll down to see products and purchase! Buy Now & Don’t Forget Your Codes “Mindjet10” for any single purchases or “MIVAP20” for the 4 for 1 Bundle!